It’s easy to get stuck in certain ruts in the way we think about food. 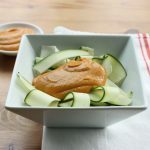 Because my first introduction to zucchini noodles was to use them in raw food dishes, I’ve gotten in the habit of only thinking about them that way. 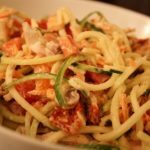 Of course, zucchini noodles are wonderful cooked, and the raw ones can also be paired easily with roasted or seared or steamed or sautéed ingredients, too. 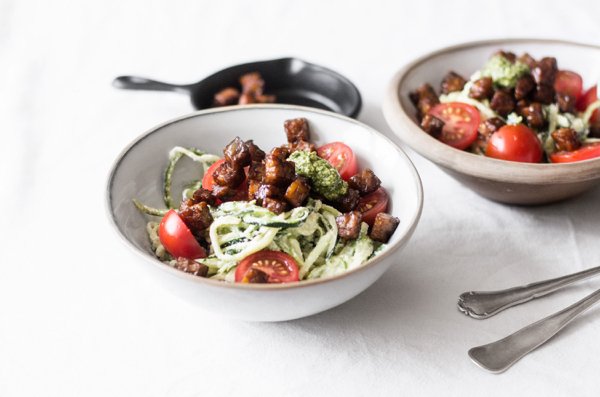 This recipe for zucchini alfredo with cherry tomatoes, basil, and seared tempeh combines cool zucchini noodles with hot, savory seared tempeh for a nutritious and balanced meal. As is often the case, this dish emerged from seeing what I had in my fridge and getting creative with it. I got back to DC after a week out of town recently, and my fridge was a little bare. That said, I did some still-crisp zucchini and a box of plump cherry tomatoes. I had (as usual) tons of cashews, and so some sort of zucchini noodle + cashew cream situation seemed like a good idea. As I was peering into the back of my fridge to find a lemon, I noticed that I had a package of flax tempeh that I’d forgotten about. It was a perfect opportunity to add a protein to the dish. I promptly got to chopping my tempeh into cubes and searing it in a tiny bit of coconut oil. I whipped up some cashew alfredo sauce and spiralized my zucchini into lovely, long ribbons. And I took a moment to appreciate the wonderful recipes that can happen when you get creative with what you have. Heat a large skillet over medium high heat. Add the vegetable oil. When it's shimmering, add your tempeh. Sear the tempeh for about 2 minutes on each side (8 minutes total for the cubes), adding splashes of tamari or Bragg's as you go. Set the tempeh aside. Blend all sauce ingredients together in a high speed blender till smooth. Transfer your zucchini noodles, tomato, and basil to a large mixing bowl and add all of the sauce. Mix to combine, divide into four serving bowls, and then divide the tempeh evenly onto each bowl. Serve with a fresh green salad or another vegetable accompaniment. 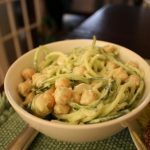 Tempeh and raw zucchini pasta may not immediately seem like bedfellows, but they’re terrific together. I love how the earthy, chewy tempeh contrasts with the tender noodles and sweet cherry tomatoes. Altogether delicious–and a quick meal option, even if you take time to serve it with a salad, too. Thanks to everyone who commented yesterday on Katie’s Green Recovery story. Have a great evening! Peanut Butter and Tomato Sauce. Seriously. Do you have a favorite tempeh brand? Maybe I’ve been scarred for life with the dining hall tempeh that just has this icky, off taste, but I know there must be some good varieties out there. I used to love it but know it kind of creeps me out! I also like mixing raw and cooked dishes together – especially in the spring/fall season when it is not super hot or cold out. At school, I usually make a salad my base and then add whatever hot grains/legumes there is on top. Yes! Lightlife flax tempeh. It’s extremely neutral tasting, and I like all of their flavors, really (not just the flax — they also have a garden veggie and a plain). Where do you get the coconut oil spray? It’s the Spectrum brand, and you can find it at any Whole Foods. This is a great post, Gena. I have been incorporating more cooked foods, like grains, tempeh and tofu, mostly for dinner. I’ll often combine cooked and raw, like a kale salad over cooked quinoa or a gluten and soy-free bean and veggie burger over lettuce with salsa. I also LOVE soups! Being flexible with cooked food helps extend my meals for several days, save money and freeze portions for later. Hey Gena, I have a random Q for you: when you have aged veggies, are you still likely to eat them raw? I figure for safety issues, would it be better to use your zucchini cooked? Thoughts? You know, if a veggie looked old/suspicious enough for me not to feel comfortable eating it raw, I would probably not eat it. I’m so used to raw food prep that my standard really has become, is it safe to eat raw? In this case, the zuke was truly still 100% firm and crispy — no bruising or softness. I had left it in bag with a damp paper towel, which is my trick for crispy longevity in produce! This recipe is making me drool. I can’t wait to try it! I’ve been on a massive tempeh kick the past two weeks. I have bought like 5 TJ’s packs of it in the past couple weeks and have been making it up in all kinds of ways from searing it with sauce to just slicing it and eating it. I don’t know why this food was not in full rotation the past few years but it’s back now! This looks so good. I would have never thought to put tempeh in “pasta”, but I can see you it would really work. I’m with you–nowadays I’m more flexible about raw/cooked than about many other things in life! I don’t mind including steamed veggies in a salad, for example, and I use store bought nut milk at times, which would have been an abomination to my former strict self! I also like the idea of having a sauce or dressing that can cover veggies (raw or cooked) or pasta (ditto) equally well. Glad you caught yourself and shared the moment! I purposefully mix raw and cooked food often. Admittedly I sometimes feel weird about it, as if I am doing something bad by adding food to the meal that is not raw. I have to remind myself that this is silly. The reason I eat a lot of raw foods is not because I think cooked foods are evil, but because I want the extra nutrition that can be provided by eating raw foods. Similarly, with cooked foods, I can get nutrition that I have a hard time getting from cooked foods, such as lean proteins and carbs without a lot of sugar. Your recipe looks really yummy! I’ve never aspired to be 100% raw, so I have never had a problem mixing raw and cooked. Truth be told, decades before I embraced the “raw” label, I was eating a high raw diet (fresh fruit and gigantic salads have been the staples of my diet forever). If I prefer a food cooked (beets, peas, squash), I’ll go ahead and cook it. And maybe since I’ve always mixed raw and cooked food (hummus or pasta with tons of fresh veggies, yogurt with raw honey and fresh fruit, etc. ), I have no problem adding, say, toasted sesame seeds to a salad, or enjoying non-raw chocolate after an otherwise raw meal. That said, I’m more careful than I used to be not to cook things I prefer raw – so if I’m adding greens to a lentil or pea soup, I’ll wait for the soup to cool a bit so as not to cook the vegetables. With things I didn’t eat at all before “going raw” (nuts, nori, etc. ), I do go out of my way to buy “raw” and “organic.” Ditto smoothies. And, while I’ll do a “cooked” dessert (i.e. chocolate or a gf cupcake) after a raw meal, I don’t think I’d eat a raw dessert after a cooked meal. Unless the cooked thing was a teeny tiny portion of that meal – like your zucchini pasta. I have my quirks, but I am mostly at ease mixing raw and cooked. I am embracing the part raw part cooked thing too. I think it’s even more messed up to feel like cooked has to be ALL cooked, all the better to have a portion of raw and then some cooked food as you’d like. Lately I love tons of raw veggies or salad with hummus, it’s a great blend of the two, since it has been a cooked hummus (I don’t digest raw chickpeas well). Great idea to put some tempeh on there with the pasta. I totally agree. I think the most important lesson raw foods have to offer (in some ways) is to show us that most of us just cook too much of our food. Period! You are so cute! It is so true, it can be hard to get out of the all or nothing mind set. Thank you for reminding us to branch out! I think there are lots of ways to indicate that you value veganism, but don’t feel that it’s a lifestyle that works for you entirely. I’ve always found ways to tell people that I prioritize raw food without being a true raw foodist; sure, it’s more of a mouthful than saying “I’m a raw foodist,” but it does a good job of accurately describing my diet and lifestyle. I think I’ve said this before on the blog, but for me personally, veganism isn’t just about me — it’s a choice (and to some extent, a public statement) I make more for animals than for myself, which is why it’s a choice I make wholesale. But my interest in raw food is a choice that I make for health, taste, and personal fancy, which is why I’m comfortable interpreting it on a spectrum, and exactly as I see fit. I realize that a lot of other people have the same attitude toward veganism as I do toward raw foodism: either it’s primarily a taste and health choice, in which case they’re comfortable making exceptions, or they’ve reconciled some animal consumption with their fundamental desire to make animal-friendly food choices. I personally believe that veganism is the most effective way to exercise and advocate compassion for animals, but I do try to understand other points of view on that score. Oh, and PS! YES raw foodists get annoyed with me. All the time!!! But I stand my ground. I have good reasons for eating mostly, not all, raw, and I don’t think I’m misleading anyone with the language I use. When I first started to get into raw foods I was very distinct about having 100% raw meals (I was never 100% raw overall) as I felt that for some reason the entire meal had to be raw to ‘count’. Thankfully, with inspiration from blogs such as yours, I’ve realised that I can still enjoy eating lots of raw food but I no longer focus on having 100% raw meals. I love mixing raw and cooked and in fact I think it works better for me that way, for example my breakfast this morning was popped amaranth (cooked) coconut milk made from raw coconut flour (raw), frozen berries (raw), pecans (raw) and maple syrup (cooked) I just love that I can get the best of both worlds now. 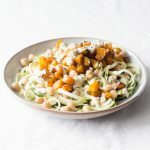 I also find that it helps me stay balanced and more in tune with my climate – over the winter I still ate my favourite salads but topped the raw romaine with roast squash – another great idea taken from your meal sized salads post. Thanks for helping to show that you can make enjoying the benefits of raw food work for different people! I mix raw and cooked foods all the time in the same dish, but then again, I don’t consider myself a raw foods enthusiast and have no desire to label myself this or that. This type of food identity labeling is meaningless and seems obsessive to me. If I had to guess, I’d say I probably eat a 60% raw diet on average, perhaps more raw in the summer months – simply due to practical issues (less desire to turn on the stove/oven) and the abundance of local, fresh produce. I expect I am in minority here, but I personally don’t believe that raw foods impart any special health properties or enzymes and haven’t seen any real science to back up that claim. Also, I don’t digest some foods/vegetables well in their raw state, so if I were to eat a “high raw” diet, I wouldn’t feel my best. On a day to day basis, I usually let my taste preferences and mood dictate: certain foods I lightly steam, others I roast, and others I eat raw. i love raw foods but i also like soups, curries, and believe in a holistic macrobiotic diet. people often like to just stick to one thing but there is so much more to explore if you just think outside the box and combine it all. i believe there are great things in every diet, every culture has its own approach to i.e. salad and you can learn to make a new salad everyday because every person adds different things and has a different way of making their perfect salad. in that case, i am similar to u, i love my raw salads, granola, green smoothies and juices but i also love to have a nice roll of brown rice sushi and a warm carrot and ginger soup or sometimes even a piece of nutritious bread. great post gena, inspire us all to “think outside the box”! 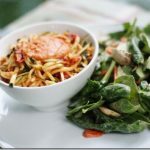 This dinner looks wonderful Gena, I love zucchini noodles and am a big fan of merging raw and cooked. Never had tempeh in all my years of veganism!?!? Gah! You must!!! Tempeh is by far my favorite soy food (I like tofu well enough, but much prefer tempeh) and it’s the only real “meat substitute” I’ve ever liked; the texture is so hearty and delicious, and the flavor is nutty and totally unique. It’s fantastic. Tempeh is a new love in my food world. It adds so much flavor & chew to any dish. I love that you added it to the zucchini noodles. Crunch & chew, together, is perfect! Wonderful dish, I adore raw Alfredo and need to try this version. 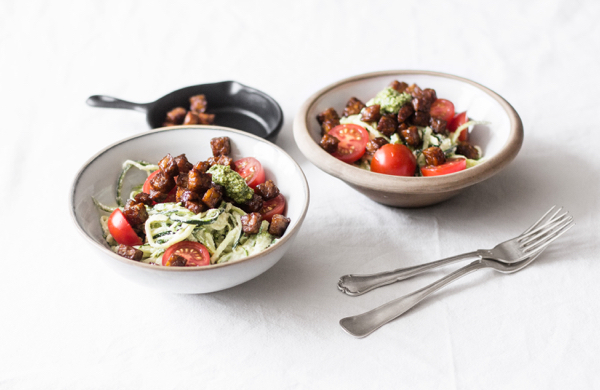 I tend to blur and mix raw recipes with cooked foods a lot lately – baked tempeh cubes topping raw salads, raw sauces coating lightly steamed veggies and sides of steamed edamame with raw dishes to make harsher foods easier to digest and increase protein. I like that dishes can still be high raw and nutrient dense without being all raw, especially for the winter. This looks so wonderful! I love this sentence — “My whole identity as a food lover is bound up in integrating raw and cooked foods…” That’s kind of been my thing as of late – high raw meals accented with nutrient dense cooked ones. i.e., throwing quinoa or lima beans on my salad. I’ve found, that It keeps me satiated longer and thinking about food less.. Win. Win. How does one “spiralize” zucchini? I love this glimpse into your attitude with raw foods. When I first started eating more raw foods I found myself drawing a distinct line between raw and cooked. Now I find myself craving cooked grains or legumes and not hesitating to add these to my meals. I’m still working on finding a good balance between raw and cooked foods, but it’s liberating to have that fluid line! I tend to blend my raw food dishes with cooked food. For example, I make several batches of raw pizza crusts a month and use them as vehicles for non-raw ingredients… mushrooms, pineapple, tomato sauce, garlic – all cooked and then a tofu cheese sauce. Or I will use them to eat hummus (cooked) and chopped veggies (raw). Also, I make raw bread with sprouted grains, dates and walnuts in the dehydrator, but I almost always toast it when I eat it and slather it with roasted nut butters, which I find tastier. For me, raw offers the exciting promise of gluten-free and easy digestion, which I appreciate, plus extra fiber and easy to make meals. This looks like a really innovative dish. Can’t say I have seen anything like this served anywhere I have eaten. Will have to give the Raw Zucchini Alfredo with Cherry Tomatoes, Basil, and Seared Tempeh a try sometime. Thanks for posting. This looks delicious! I am often looking to use up what I have in my fridge as I get sad when I waste food – I love that you incorporated the tempeh into an otherwise gorgeous raw food dish – to me this is the beauty of celebrating raw foods – enjoying what you can in it’s best (or most vital) state while also celebrating (and using) other healthy cooked foods. I love your approach to food labels too..very balanced, honest, and practical! 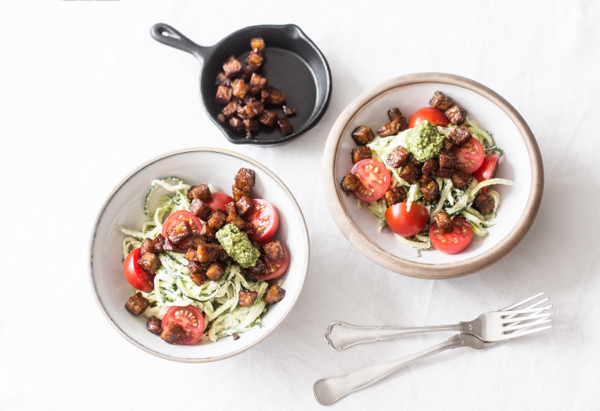 I’ve been on a total tempeh kick lately so was thrilled to see this recipe from you! I was always inclined to separate cooked and raw foods, especially if I had eaten raw all day for example, I wouldn’t want to “ruin” it, but that was way back when I took my raw food advice from holier-than-thou raw food purists. As someone who had never really given any thought to food at all until recently, a raw food lifestyle used to sound really scary and weird to me. It’s through your blog that I have learned how elements of a raw food lifestyle can be easily incorporated into pretty much any food lifestyle. I will probably never go fully raw and I may or may not go fully vegan eventually, but by including more recipes of yours, I find that I tend to be drawn to more raw and vegan foods in my everyday life. I think that if you had too much emphasis on a raw-cooked dichotomy, I would never have been able to approach some of these foods which are now staples to me (I didn’t even know that chia and hemp were foods and now they are some of my favourite additions to EVERYTHING). This sauce is amazing! It’s spoon into your mouth like ice cream worthy. Thanks for an awesome recipe! 1. I added a clove of garlic to the sauce. 3. Blended 2 basil leaves with the sauce. 4. Blended a handful of spinach in the sauce.